Seiyu Shinjo, the Shinjo’s first son, was Born July 10,1929. Kanbun became fond of the exuberant young Seiyu, who pleaded for years with his father to let him study karate. Seiyu became a student at Kanbun Uechi’s Tebira dojo in 1939. He was ten years old. Seiyu and other new students performed cleanup and other duties around the dojo. The first three months of training consisted of doing Sanchin steps across the dojo. Holding his arms in the proper position was added to the stepping, the following three months. The rambunctious young man complained daily to his father that they had done the same thing in class again. 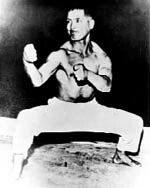 Seiyu remained determined to learn karate. Eventually Seiryo began teaching his son at home, in addition to Kanbun’s teachings. Seiyu Shinjo was exposed to an unprecedented learning opportunity for nine years. The harsh conditions in Japan after the war facilitated the decision to return to Okinawa. The Shinjo family traveled with Seiko Toyama and Kanbun Uechi. Seiyu was leaving the only home he had every known. The group was interred in a prison of war camp for six months, when they returned to Okinawa. To lift moral in the camp, Kanbun demonstrated karate. It was the only time his students saw him perform all the katas in their entirety. In Japan he always taught explosive individual moves from a kata, ikyodo, but never demonstrated the entire kata. After release from the camp the Shinjo family and Kanbun Uechi relocated on Ie-jima Island where he died on November 25, 1948. The Shinjo’s were the only ones present.